On Sept. 14th 2010 we had the pleasure of welcoming email marketing metrics Jedi Luke Glasner of Glasner Consulting to eMail Radio. It was a fantastic show which has gotten raves from those lucky enough to catch it live! If you missed it, you can check the podcast out here! 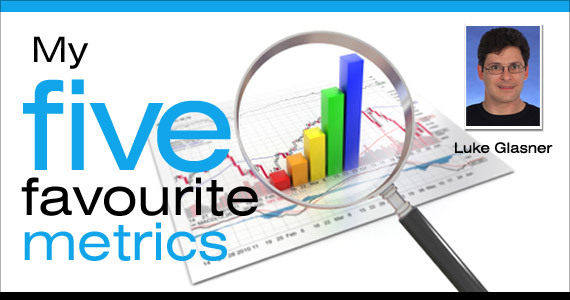 We asked Luke about his five favourite metrics and he’s obliged with this post. There are many metrics worth tracking in email from average revenues to spam complaints, but which are the ones you need to track for your programs? Here are five metrics that I track for my program’s success that you can use in yours. Clicks and Click through Rates (CTR) are perhaps the most obvious metric to track, but are also one of the most informative. When tracking your CTRs, be sure you are tracking each specific link within the email, not just overall CTR. Track your CTR not only by individual link and by email but also by subscriber. One of the most important pieces to unlocking the metrics puzzle is to track down to the individual subscriber level. Clicks at the subscriber level may be used for a number of purposes, but the primary use is to judge response rates for conversion, creative effectiveness and as a measure of engagement. This data can in turn be used as response indicators for predictive modeling, subscriber segmentation and other statistical analysis. Time on File is simple to track, yet many marketers don’t use the full capability of this metric. Time on File is used to determine an email’s address average lifespan a key component to many of the metrics below. When combined with engagement measures (such as an index based upon clicks and opens) it can be used to determine when the average subscriber becomes emotionally unsubscribed. It tells you the average lifespan by subscriber or by segment for Average Subscriber Value or other lifetime value calculations. It can be used to evaluate list sources and acquisition methods that provide the longest active subscribers. Finally, time on file can be used for a variety of lead nurturing programs, re-activation programs, recurring content timing, and other time based uses. While many email marketers have access to this data via their ESP, few use it to the full extent of its capabilities. Determining your subscriber’s time on file does require tracking to the individual subscriber level, this is often the easiest metric to track at the individual subscriber level as it is based off the opt-in time stamp in your ESP’s reporting. List Churn, is a value that represents how many subscribers you lose in a specific time period, in other words how many addresses go bad, in a month, a quarter or a year. Tracking how many subscribers are being lost, will tell you how many subscribers you need to acquire to maintain your current list size and to grow beyond that number to reach business goals. When combined with Average Subscriber Value and Lifespan, they tell us about our list’s health, its value and its average life. When combined with Cost per Response, it tells us the marketing costs to maintain and grow a specific list size. Cost per Response (CPR) is a metric designed to take into account the full cost of a response, and is most often used to calculate the costs of acquiring a new subscriber. Cost per response is often referred to as Cost per Acquisition; however, the true beauty of this metric is that it is not confined to acquisition only; the same formula can be used to calculate the cost per response to any type of marketing. Some examples are calculating CPR for a specific email campaign, the average cost per response in the email channel overall or for comparison with other forms of marketing. CPR is a great way to compare the effectiveness of one marketing campaign or medium vs. another. Using it, we can evaluate email marketing vs. search marketing or traditional media like print, or to determine the most cost effective list source or list growth method. Cost per Response works with both one step and two step conversion processes; is often used as the basis for break even calculations and for Return on Investment (ROI) calculations. Cost per Response becomes the cost factor in break-even analysis of all types and will tell you the financial resources need to grow a list to a specific level, maintain a specific list size, your list’s profitability levels or growth and as the basis of other financial measures. Average Subscriber Value is a simple method for determining the average Lifetime Value of an email customer, most often using a period of one year (to avoid having to create discount rates to account for changes in the time value of money). It is very useful for determining the most profitable list sources and subscriber acquisition methods when combined with CPR, as well as break-even points – forming the revenue side of the equation. Using average subscriber value and cost per response together gives email marketers a strong case for advocating for funds by showing the value of email. For sophisticated marketers, be sure to include revenues for multi-channel campaigns where email influenced a sale. One example of this might be increase store traffic or website orders shortly after an email campaign goes out. Often coupons are used to help track email influenced sales offline. Takeaway: So which of these metrics above or others not listed here are the most important? Like many things in the email industry, the answer is “it depends.” The best metric to use is the one that most accurately answers your specific business question or guides you to your specific business goal. Often we, as marketers, are hung up on totals – total dollars, total clicks, total ad views (renders) but as it is important to track results to the individual subscriber level – our unique numbers. It is also just as important to remember that each unique number represents a unique subscriber, who is also a unique person. Respect your subscribers by getting permission, setting proper expectations and sending relevant timely content and you will find that metrics will continue to grow positively. As the Co-Chair of the Email Experience Council’s Measurement Accuracy Roundtable since 2008, Luke has played a lead role in creating the first industry standard for measuring email metrics and how the calculations behind those metrics are applied by Email Service Providers. REally helps with the email marketing campaign I am working on right now. Absolutely! Missed the eMail Radio show, but thanks for sharing the main points from it. Appreciated. Great post and follow up to the Email Radio show. THese are 5 great metrics everyone should be tracking and using to quantify their email marketing campaigns. You explain them well and give the reader a great starting point to use these metrics.